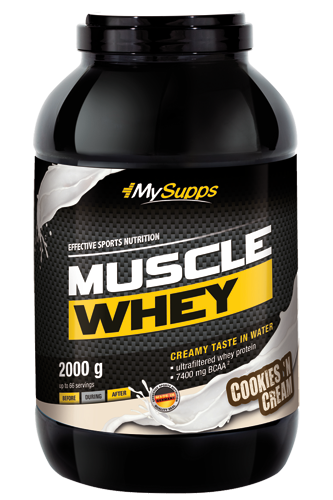 Muscle Whey from My Supps provides a premium blend of proteins consisting of whey protein concentrate & soy protein isolate. You save 10,00 € respectively 29% ✔ Delivery time 1-3 working days within Germany. Content is sufficient for use according to our recommendation for 66 day(s). Are you looking for an affordable protein shake with a delicious taste that can supply you with all the nutrients essential for your muscle building workout? Muscle Whey from My Supps contains a well selected blend of proteins consisting of 50 % whey and 35 % soy protein isolate with a high biological value. In addition, the powder mixes into a creamy shake when combined with water or milk and supplies the valuable amino acids BCAA for muscle growth. This makes Muscle Whey the ideal companion for all your training workouts. Muscle Whey from My Supps is suitable for all athletes who wish to provide their body with high-quality nutrients following a workout. The delicious shake easily dissolves in water or milk and ensures fast post-workout regeneration by providing the muscles with adequate amounts of protein and BCAA. Furthermore, people who unilaterally ingest protein mainly from fish, meat and sausage products will also benefit from taking Muscle Whey. Thanks to the manufacturing process, the whey and soy in Muscle Whey are readily available to the training muscles. As a result, build-up processes can continue to run as quickly as possible. This is also further enhanced by the BCAA, which are an integral part of the muscle cells. Which products can I combine sensibly with My Supps Muscle Whey? With the My Supps Carbo XT to increase carbohydrates storage (muscle glycogen) in the muscles. In combination with the Body Attack Glutamine 10000 for a better supply of protein metabolism. With the Body Attack Magnesium Liquid, a mineral that can contribute to normal energy metabolism and muscle function. In combination with the My Supps Creatine to increase physical performance during short and intense strength training.